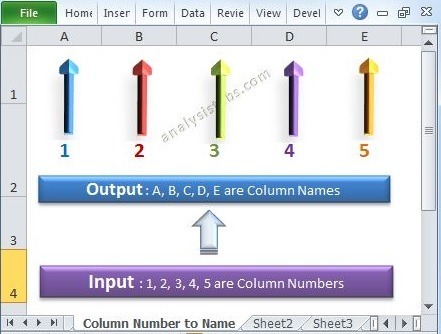 Excel VBA Macros for Beginners - 15 Examples File download - ANALYSISTABS - Innovating Awesome Tools for Data Analysis! Excel VBA Macros for Beginners – These 15 novice macros provides the easiest way to understand and learn the basics of VBA to deal with Excel Objects. 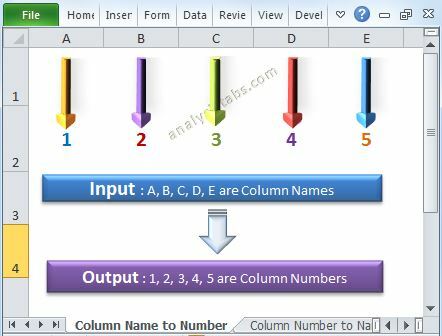 Learning Basic Excel VBA By Examples is the easiest way to understand the basics of VBA to deal with Excel Objects, in this tutorial we will not covering any programming concepts, we will see how to access the different Excel Object using VBA. While automating most of the Excel Tasks, we need to read the data from Excel spread sheet range and perform some calculations. This example will show you how to read the data from a worksheet range. After performing some calculations using VBA, we generally write the results into worksheet ranges. This example will show you how to write the data from VBA to Spread sheet range or cell. Range("B5") = "Hello World! using Range"
The following example will help you in formatting a cell or range by changing the background color of a range. We can use ColorIndex property of a Ranger Interior object to change the fill color of a range or cell. You may need to change the font color of range or cell sometimes. We can differentiate or highlight the cell values by changing the text color of range in the worksheet. The following method will use the font ColorIndex property of a range to change the font color. This example will help you to change the text from lower case to upper case. We use UCase Function to do this. If you wan tot change the text or string from upper case to lower case, we can use LCase function. This example will help you to copy the data from one particular range to another range in a worksheet using VBA. This example will help you to select one particular worksheet. To activate one particular sheet we can use Activate method of a worksheet. We can use Name property of a active sheet to get the worksheet name. We can use name property of active workbook to get the name of the active workbook. We can Name property of worksheet to rename or change the worksheet name. We can use Add method of worksheets to add a new worksheet. 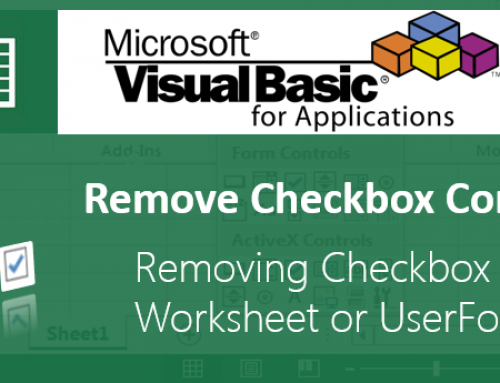 Use Delete method to delete a particular worksheet. The following examples will help you to adding some data, saving the file and closing the workbook after saving the workbook. 'It will save in the deafult folder, you can mention the full path as "c:\Temp\MyNewWorkbook.xls"
We can use hidden property of rows or columns of worksheet to hide or unhide the rows or columns. This example will show you how to insert or delete the rows and columns using VBA. 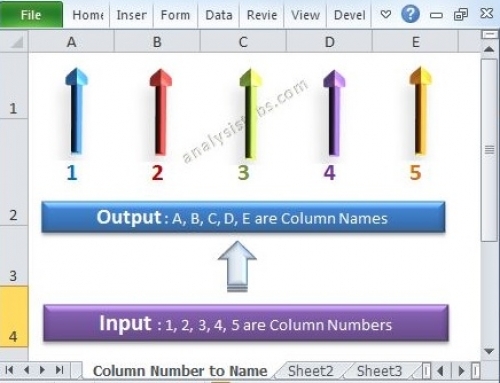 We can set the row height or column width using VBA. The following example will show you how to do this using VBA. Merge method of a range will help you to merge or unmerge the cell of range using VBA. When dealing with Excel VBA, often we compare the values. A Simple Example On If Condition will help you to understand -How To Compare Two Values? MsgBox "Done! Printed 1000 integers in Column E"
You can download the below macro file and execute it to understand well. 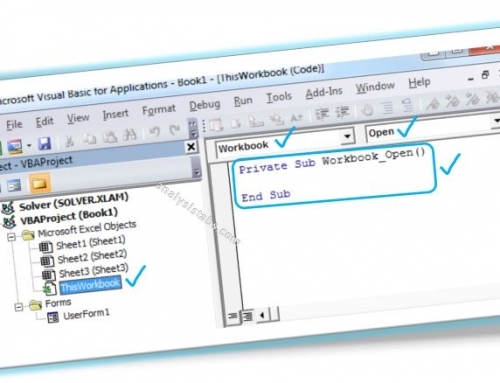 The below codes will help you to use VBA in real-time application while automating your tasks. A BIG THANK YOU FOR THIS!!! Thanks for sharing your wonderful knowledge, anyway I wonder if you can share real-life examples of VBA Macro project. And step-by-step guide for it. Thanks for your commends and suggestions. Sure, I am working on real-time Excel VBA tools/projects and I can share as soon as possible. And Yes, I will prepare some step by step explained guides to explain the topics with real-time examples. Thank you Ben- I corrected it. Thanks and welcome to analysistabs Jagga! In a given data Table in two columns there are data’s, but along with those data’s there are blank cells in the columns. What would be the code to delete those blanks cells in the column of the data table. refer the below topic, we have provided # of example for verity of requirements to delete rows/cells. Please correct me on this code to concatenate two text with space between them. Thanks a lot for this wonderful tutorial. You are sharing valuable infromation for real learners. Thanks a lot. Thanks for your valuable feedback. I am glad to know that you found our tutorials helpful. We are happy to hear such a great feedback from our readers.It motivates and helps us to work hard to meet our readers expectations. Kindly accept our sincere regards to providing us such a wonderful platform to learn and understand the actual usage of VBA. Thanks for such a sweet feedback. We are glad to hear nice complements for our VBA users, it always motivates me to give my best and share more useful stuff for our users. Need some help making a slightly complex tool. How much can you help me? Is there a way I could mail you? Where are you based? Thanks for contacting us. We are based out of Bangalore, India. We are happy to help you in building tools using VBA, please let us know your requirement. Your website its really very good and helpful. I was trying to create an account at your website however, could not find an option to register. Please do help me out with path to create an account. I am learning how to create VBA Excel Macros. I have a question, no idea if this is the right way to ask..
above is my data i want to highlight those debit transaction id which have equal credit amount. I am trying to solve it with IF condition. Here is the macro for highlighting the matched credits with debits. Thanks for your quick response. I really appreciate your assistance. You are welcome Atif khan! Thanks-PNRao! Need to extract the the table from particular table from database and need to analyse each column value such as how many null and special characters(i,e ?,#) in the column. We can do this using ADO, please refer the below article to extract the data from database. We are happy to provide our premium help to develop a tool (Excel VBA application) to achieve your requirement, please let us know if you want us to develop. Please feel free to contact us if in case of any questions. I am working on Excel to blink cells in a row, what i actually want is the text in a cell only to blink. I have this code which i got from the web and made some modification. Hi Sandip, Thanks for great feedback. I am glad that you are learning by visiting our blog. I have been using VBA from last 10 years. I recommend every IT person must learn to enjoy their work. It can finish most of your job and give you plenty of free time to relax and learn new things. 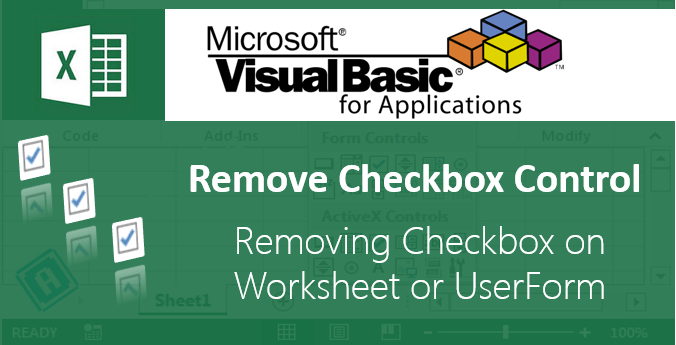 After discovering this VBA tutorial website of yours, you are now my newest Excel Hero. Thank you and keep up the great work! I have a requirement of reading hierarchical XML file to excel ( Reading entire xml or only particular nodes), can you provide the VBA script for this. i am the great fan of your website. Thanks and Welcome to Analysistabs.com! Join in our Forum and let’s get more interacted. We are using single quote(‘) to write comments while writing macro in VBA editor window. The below statement 5 represents the index color number. ie Blue Color. You can change this number according to your wish. If we want to change any text to either upper case letters or lowercase letters we using function UCase and LCase. Please run the macro for better understand. Lets say Range(“C2″)=”Analysistabs” in worksheet. Hope you understand the macro.